I was out running with Miss K and J Bear in the double stroller last week, lost in thought while huffing up a steep incline, when suddenly it dawned on me: I can’t do this anymore. No, wait: I actually don’t want to do this anymore. Not because I’ve lost interest or don’t enjoy the time we spend together – on the contrary. I love running with the kids - some of the best runs of my life were spent in their company. But they’ve simply grown too big and the stroller too heavy for double stroller running to be a feasible, enjoyable option for us anymore. This chapter is drawing to a close*. But, since arriving in New Zealand, I’ve inevitably started really looking forward to my solo weekend runs, when Will could watch the kids. It’s become the highlight of my week, simply because it would give me the opportunity to run. And I mean really run - not battle to navigate a 40+ kg steel structure around every single twist and turn like an ant pulling on a loaf of bread; or grunt and heave it up sidewalks and inclines, using my last ounce of energy to prevent its occupants from pulling each other’s hair out. I’m craving running. So thanks sweet K and Mister J for the best running chapter of my life. I cherish each and every mile we've ever covered together - from those first, painfully slow crawls after each of your respective births, to the races and the parkruns, the poopy shirt runs and the sing-at-the-top-of-our-lungs runs. I can't think of anyone else I'd rather have spent those miles with - you're the best running buddies I've ever had. And, who knows, perhaps one day, when you're bigger, we'll share some miles again on foot - I absolutely cannot wait! 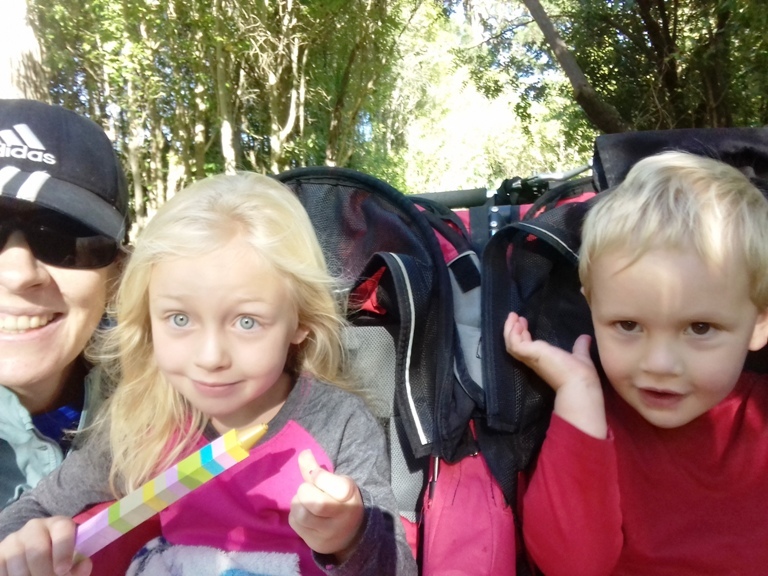 *Note: We'll still be doing the odd double stroller run until K and J have started and settled into school here in NZ, so don't expect the double stroller pics to completely disappear for now...! But, as mentioned above, running with the stroller is becoming increasingly difficult from a physical point of view, so we'll slowly be phasing it out over the next while. The single running stroller, though... That's another story! A quick and hearty "hi!" to everyone visiting from the Runaway Bridal Planner blog hop - thanks so much for stopping by! I'm really looking forward to getting to know all of you a little better over the next two weeks. Thanks also to Kristy for hosting! This was really sweet. :) I'm sure you guys will all run together in a few years! I have much respect to everyone who runs with a stroller. Sometimes, I feel like my phone is too heavy to run with. Great to meet you. Today is my spotlight day in the blog hop too so I wanted to say hey really early and I look forward to reading more of your content soon. Enjoy your day in the sun. Mad props to anyone who can run with a stroller! I see them fly by me in races and I am just in awe. I can imagine starting a new chapter would be bittersweet, but you will have those memories forever. Hi Wendy! They're definitely memories that I will cherish forever - four-and-a-half years' worth of memories! Good, good times :) . Thanks, Janelle! 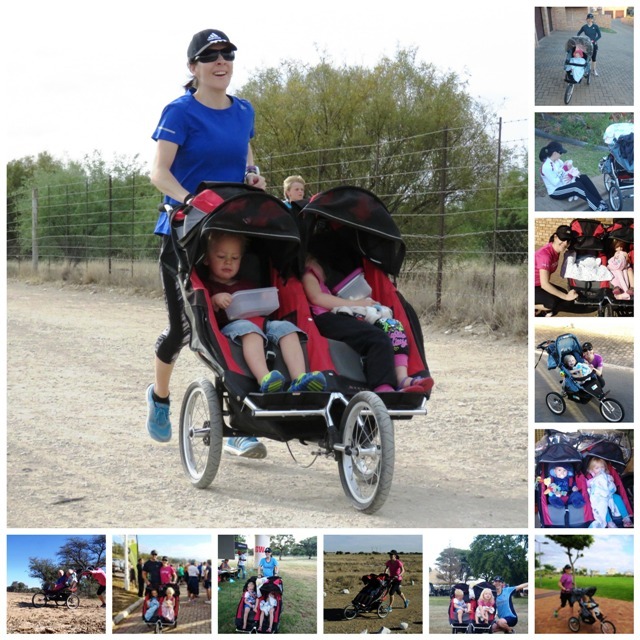 You'll love running with the stroller - it was without a doubt the best running chapter of my life so far. And if you start them in the running stroller early, the kids love it too - highly recommended! Believe me, Chaitali, a running stroller is a young mama's ticket to running freedom ;)! 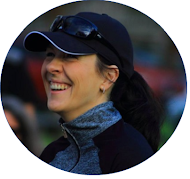 I often didn't have a babysitter and my husband cycles, so he uses Saturdays for long training rides, so if I didn't run with the stroller, I wouldn't be able to run at all. But running with the stroller wasn't a bad thing at all - the kids and I both loved it! I'm a mom with 2 kids as well. I admire your dedication to get your running in regularly with the double stroller. And what a sweet goodbye to that phase of your life that you shared here. It's so cool that your kids have been growing up and seeing you running -- so healthy and strong! my sisters always say how much harder it is with kids to run, and yet different kinds of fun. I bet you do love that alone time though, sometimes I think we all need that! Beautiful photo's you have some adorable kids!!!! Thanks for joining up in the hop! Definitely a different kind of fun - a kind that makes you STRONG, haha! But one I wouldn't trade for anything. Thanks again for hosting, Kristen! Oh, I so feel you on this. I anticipated running with both of my kids (they are three years apart), but my son simultaneously grew far too large for the stroller right as his infant sister realized that THE STROLLER IS EVIL AND SHE WILL HAVE NO PART IN IT. So...that scenario did not play out as I had imagined. Congrats on making it so long with the duo in the stroller! And enjoy those solo runs and finding yourself/pace again! "The stroller is evil and she will have no part in it..." - lol! I must confess that we had phases like that too - thankfully they were just phases (right after both kids learned to walk), which they quickly got over. Thanks so much - looking forward to rediscovering my solo pace! One of the many perks of double stroller running is that it's a full body workout - no need for extra weight training, ha! Girl, I gave you so much credit for pushing that double stroller! It is no joke!!! Thanks, Lauren! Stroller running is hard work, but it's such a joy to run with the kids! Thanks so much, Shannon! It's been a gooooood chapter for all of us :) . Double stroller, wow! I'm sure you had some great runs and your kids enjoyed spending time with you <3 I had to let my stroller go when my daughter was 4 because she didn't want to sit while I ran anymore, she wanted to run with me. I was secretly relieved because pushing her up hills was no fun anymore and I couldn't imagine doing it until she was 5 or 6 like other moms I'd seen. It's been such a good chapter for us - I wish we could keep going until K was 5 or 6...! But she's ready for scootering and cycling around now, and is very excited about it, so I'm excited to enter this new chapter with her! Those double can be such a struggle I remember when my older's ones got to heavy for me here we are years later and I now run with my twelve year old. The Trio will reunite hopefully and they'll love running as much as Mama. I find it funny how you start off running slow with them when it's there first born and then again when they get too big. Life is just a bunch of completed circles and looks like you're ready for your next one to begin. Great post! Thanks so much! Yip, and I think the circle will be really complete one day when they start running too fast for us and we struggle to keep up, ha! Aww... That was such a sweet post! I can imagine how hard it must be. A mom-children bond is always special. Double stroller?!?! Wow!! Thanks, Madhuri! It's funny how it's always so hard to say goodbye to one chapter, but then the next chapter is just as special. It's all about living and appreciating the moment, I guess? Aww, I remember my last stroller run, too! It's very bittersweet, isn't it? Now my 6 year old is old enough to run with me! Bittersweet indeed :) . Excited about the next chapter, though! Aww, I can only imagine this transition! You're right - that would be a tough thing to give up, but I can see it being even tougher to continue consistently! You will find a new group exercise together! I actually strained my back a bit trying to lift the double stroller onto the pavement the other day, so it sadly really is time to stop. But, as you say, it's the beginning of a whole new chapter!